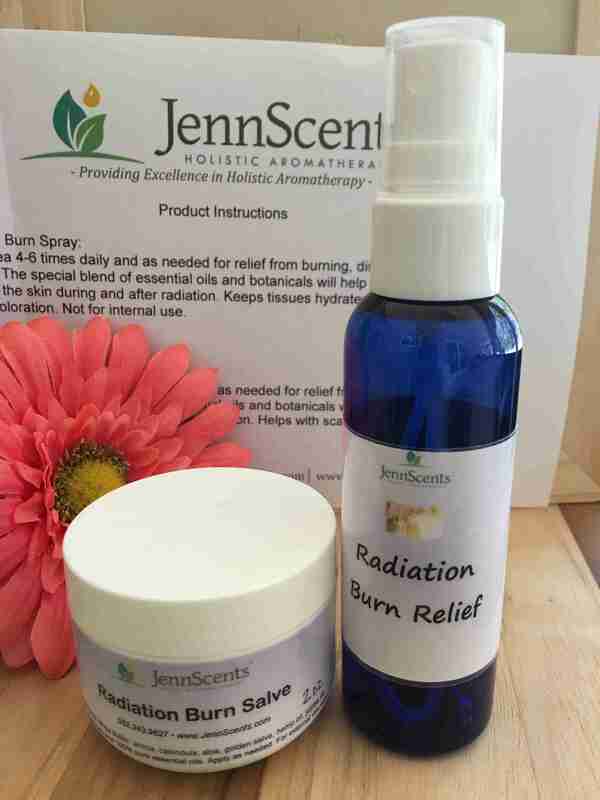 JennScents Radiation Skin Support - JennScents, Inc. I have had several family members and friends go through radiation over the years. It really takes a toll on their skin, causing burning, redness, discoloration, hardness and discomfort. Not to mention the mental and emotional aspects. As a holistic aromatherapist, blending is my special gift. I knew when my mom asked for something to soothe her skin, I needed to whip up something spectacular. Hence, my Radiation Burn Salve and Spray was born. Ever since, I love that my products can bring the much needed relief to brighten someone’s day, and relieve their pain. Our Radiation Burn Salve & Spray contain a proprietary blend of 100% pure essential oils such as lavender, helichrysum and frankincense, in addition to soothing and anti-inflammatory botanicals such as aloe vera gel, aquasol silver, arnica oil and plant enzymes. So, why does my products work so well? These plant based remedies have been historically shown and scientifically proven to provide so many benefits such as anti-inflammatory, antibacterial, analgesic, antispasmodic and vulnerary (wound healing). It is the right combination, in the right proportions to create the best synergy of potent properties. Each batch is handmade, and filled with pure love and positive energy. It is recommended to apply to the affected area 4-6 times daily, and as needed for relief. Whether you are looking or relief, or looking for a great, personalized and helpful gift for someone going through radiation, check out our Burn Salve & Spray. Happy, healthy regards from JennScents. I can see small spots appearing on my skin at lest side of my face. I believe it may be appearing because of driving a car without sun shades.